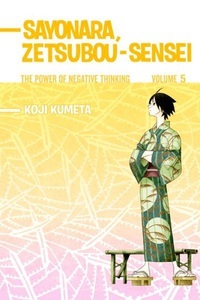 A darkly funny comedy by Koji Kumeta Zetsubou-sensei has won a trip to a hot spring, but when he finds several of his students there in the bubbling pools, he launches into a tirade about the evils of detoxing. To Zetsubou-sensei, detoxing is a metaphor for sanitizing the world of the very complexities and idiosyncrasies that define it. So put down that bar of soap and pick up volume 5 of Sayonara Zetsubou-sensei. Includes special extras after the story!